Coordinating napkins are the finishing touch to your tabletop fashions. Standard finished napkins are 14″ or 17″ (33.5 or 43 cm) square. Before cutting the fabric, square the ends, using a carpenter’s square. 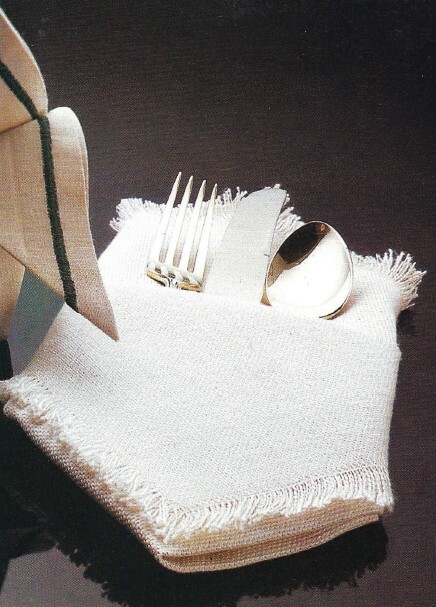 For fringed napkins, square the ends by pulling a thread. Napkin hems can be decorative. Experiment with some of the decorative stitches on your sewing machine. 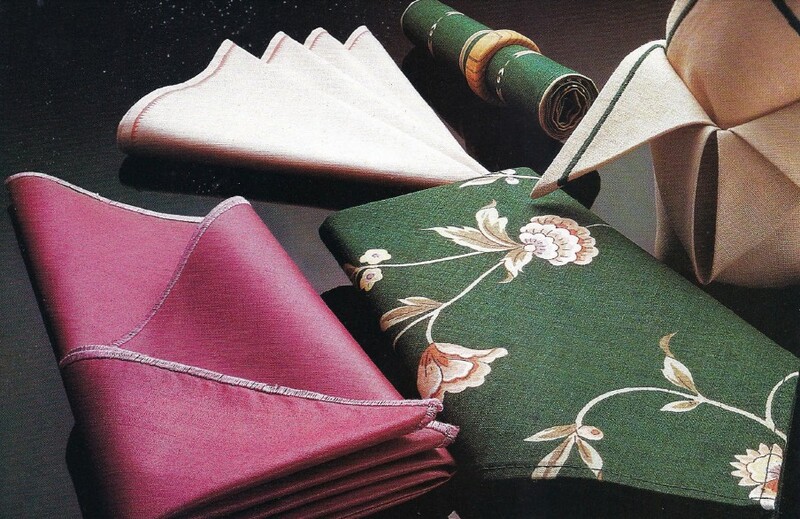 The hemming techniques shown here can also be used on tablecloths and place mats. Cut napkins I” (2.5 cm) larger than finished size. One yard (meter) of 36″ (91.5 cm) wide fabric yields four 17″ (43 cm) napkins. A piece of fabric 45″ (115 cm) square yields nine 14″ (35.5 cm) napkins. Satin stitch. Turn under 1/2″ (1.3 cm) on all sides. Miter corners Edge stitch along raw edge to use as guide. Use wide, closely spaced zigzag to stitch from right side over edge stitching. Zigzag over edge. Trim loose threads from napkin edges. Stitch over raw edge, using wide, closely spaced zigzag. Use over edge foot or special-purpose foot to maintain zigzag width. Decorative stitch. Press under I/4′(6 mm) and stitch. From right side, stitch with a decorative stitch, using straight stitching as the guideline. Blanket stitch (shown above) gives a hemstitched look. Narrow hem. Press under 1/4″(6 mm) double-fold hem on opposite sides of all napkins. Edge stitch from one napkin to the next using continuous stitching. Repeat for remaining sides. Double-fold hem. Turn under 1/4′ (6 mm) on all edges and press. Turn under another 1/4′ (6 mm). Miter corners as directed for narrow hem. Edge stitch close to folded edge. Fringe. Cut napkins on a pulled thread to straighten edges. Stitch 1/2′ (1.3 cm) from raw edges with short straight stitches or narrow, closely spaced zigzag. Pull out threads up to the stitching line.